A guest blog by reviewer James Morse. Anyone who takes up astrophotography will, sooner or later, find their way to PixInsight (PI). For many of us who grew up on other image processing software packages, PI is everything we could hope for, with one major exception, which I will come to shortly. Whether you buy into the PI mantra of being true to the data or not (I am firmly in that camp but know many others who love PI that are not), it is a wonderful suite of tools. To quote from PI’s website, its development is “the result of a dynamic collaboration between like-minded astrophotographers and software developers, who are constantly pushing the boundaries of astronomical image processing with the most powerful toolset available.“ But in addition to having the most sophisticated toolkit of any astro-imaging software package, it affords a level of control over virtually every input that is truly amazing to behold and work with. It clearly is a labor of love for its developers. But all that power does not come without complexity. By last count there are over 150 distinct processes and authorized scripts available to manipulate your images. And each one of those includes any number of parameters that the user is free to adjust, including intensity and strength sliders, wavelet layer settings, input variables and the like that, quite literally, puts an almost infinite amount of flexibility in the hands of the imager (and that doesn’t even address the powerful free form PixelMath tool that lets you create any mathematical treatment you can dream up). And that brings me, finally, to that major exception I mentioned above, namely documentation. This is a sensitive subject in the PI community. It is an issue that is regularly raised in the PI forum discussions, mainly by new users trying to get their head around all that PI has to offer. The PI developers are a bit defensive on this point and that is understandable because there is, in reality, a wealth of information and instructional materials available, from the resources offered by PI itself (such as tutorials and documentation on many tools, including helpful explanations that pop up when mousing-over various tool parameters) to all the third party materials including a host of excellent video tutorials on the various tools. I myself have developed a 70+ page workbook that I share with over 200 people around the world that is now up to Rev41a and it keeps growing with each revision. But the reason I started that workbook a couple of years back was that I had no handle on how to pull all that disparate information into a coherent whole because the thing sorely lacking has been a soup to nuts treatment of PI that is detailed, comprehensive and, most importantly, makes PI accessible to those trying to get their heads around all that PI has to offer. Until now. Warren Keller has finally filled this critical need with his superb new book, Inside PixInsight, available from Springer Press both in soft cover and as an eBook (this review is based on the eBook version). Warren is an old hand in the PI community, both as a regular contributor in the PI Forums and through his excellent set of tutorials that you can find here. With this latest effort, Warren has finally provided what PI has needed for a long time, a comprehensive and easy to follow reference manual which ties everything together and offers PI beginners a critical leg up in avoiding undue frustration. And one of the things I really enjoy about the book is what it doesn’t include. Warren sensibly did not make the mistake of so many others by retreading the basics of astrophotography such as equipment choices, and the like. Instead he is laser focused on making PI understandable from page one onward. You can get a sense of the depth of the coverage by simply flipping through the table of contents, which, in the eBook version, extends for 25 pages. With very little introduction, Part I dives right into the details of pre-processing, starting with image evaluation, and leading the reader through the Blink, ScreenTransferFunction and SubframeSelector (SFS) tools (as Warren also explains, I have not misspelled these tools but follow the PI convention of listing tools by their full names, without spaces). His description of the SFS script is the first time when Warren links into the extra materials available from the Springer Extra Materials linked to the book, in this case for an excellent SFS Weighting Expressions spreadsheet by David Ault. Warren moves on to Calibration and Integration, taking a small digression to explain what Bias, Dark and Flat masters are, then how to create them under PI, including the various options available, such as creating a Superbias to replace a regular master bias frame and describing alternate calibration methods. Throughout, Warren does not get lost in minutia. But that does not mean he is not thorough. This first section covers tools and techniques that everyone who has spent substantial time with PI will have used time and time again. As such, you would think that he has little to offer to experienced users in these starting sections, at least that was my thought when I started reading. To my surprise, though I did not learn as much in these early topics as I did later in the book, even here his coverage of the tools and their proper use opened my eyes on several different techniques that I was either not aware of or, worse, misapplying. This flows in large part from the fact that Warren doesn’t just give the basics on how to use the tool but also shows how to get the most out of it as well. The quality of the materials is a testament both to Warren’s knowledge of PI as well as the active support he received from the PI development team to make the book as comprehensive and accurate as possible. Warren also covers an important area often neglected by other sources by addressing the use of One-Shot Color cameras and clearly explaining where processes are the same or diverge between color CCD/DSLR images and monochrome images. Similarly, he thoroughly explains how to use the BatchPreprocessing Script which seems to be popular with many users of PI (in full disclosure, I am too much old school and refuse to surrender control over the individual preprocessing steps that BPP imposes). Inside PI next moves on to Linear Processing, covering the use of Projects, cleaning backgrounds, cropping and RGB ChannelCombination, before taking a long, and much needed detour into one of the most challenging subjects faced by old and new users alike, creating and using Masks. Warren devotes 17 pages of the eBook to this critical skill, and looking back at my copy shows whole pages that I have highlighted for future investigation and use. He spends almost the same amount of time covering Deconvolution and then even more resources on Linear Color Processing/Noise Reduction and stretching data. Each of these four areas (masks, deconvolution, noise reduction and stretching) must be mastered if you are going to do justice to your data and Warren dedicates the necessary space to ensure that imagers have what they need to deal with these techniques successfully when using PI. The book then takes an interesting turn, literally taking “A Look Back”, where Warren suspends his detailed tour to turn to PI fundamentals, such as how to navigate drop down menus, optimize PI’s settings, and explain the various explorers, toolbars and other organizational tools. I was at first put off by the turn, wanting to get on with finding more gold nuggets in the text and distressed by the need to cover these basics. The fact is though, that any manual worthy of the name needs to address these issues and, on reflection, I like the fact that Inside PixInsight saved the digression until after whetting our appetite with “meatier” fare. It was after this digression, however, that the book really took off for me, and I expect will do the same for other experienced users. As I flip through the text while writing this review, starting with Nonlinear Noise Reduction in Chapter 15, there are few pages that I haven’t highlighted to a greater or lesser extent. I particularly liked Warren’s chapter on Contrast and Sharpness which is where, using Warren’s phrase, jaw dropping images are made. Another welcome treatment covers Archiving and Exporting your data, critical but rarely covered in any detail. The text then again switches gears by pulling together all that has come before as two separate workflows, one dedicated to One-Shot color imaging and the other to monochrome imaging. Both walk through the steps in a logical progression, referring the reader back to details covered earlier where necessary. They form an excellent summary and application of all that has come before. 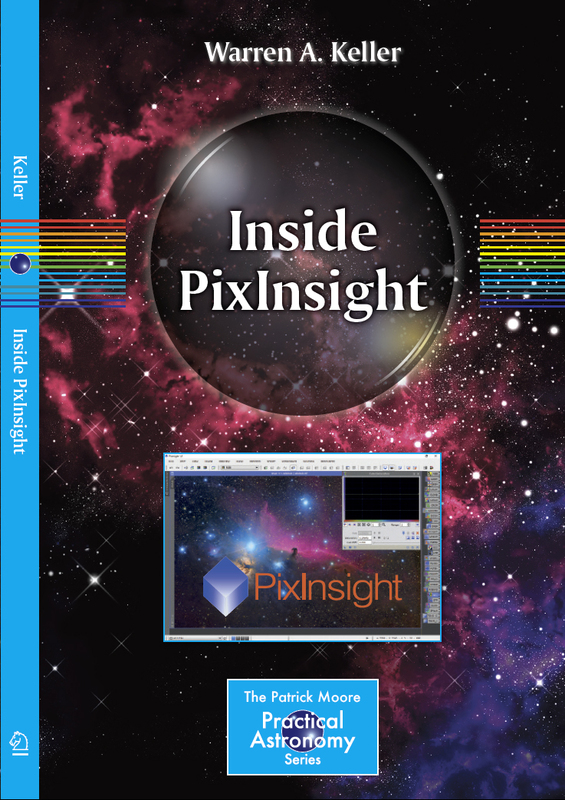 If Inside PixInsight stopped here, it would already be more than worth the price. But Warren layers-on four more chapters covering special processing issues, including Multiscale, Drizzle, High Dynamic Range and Comet techniques, Narrowband imaging, creating mosaics, and a final section on even more complex masking techniques as well as a treatment of PixelMath (though admittedly, even Warren recognizes that topic is far too complex an area to treat fairly in the space he had available, instead pointing the reader to various excellent resources available on the web). Finally, Warren recognizes that PI is not a static product but one that is always evolving. As such, he is already at work on updates that he will be providing through various resources, including the Springer Extra Materials mentioned earlier. Even without that continued effort, however, the book covers the core of PI’s processing strength so well that it will remain relevant for a long time to come. If you have read this far, you know that I am deeply impressed with the scope and quality of the material in Inside PixInsight. I was admittedly skeptical that I would get much out of the book, especially since I have been writing my own workbook for a couple of years now. Still I bought it, before being asked to write a review, because I recognized the need for the PI manual everyone has been clamoring for and hoped that it might include a few clever ideas I hadn’t considered. That was either arrogance or ignorance, take your pick. I simply had no idea just how much I still had and have to learn. What I can now say, with confidence, is that I will be revisiting lots of old data sets, knowing that what I learned here will dramatically improve my processing results. Buy it here, read it, apply it, and most importantly, enjoy it.